The Seneca tribe of Native Americans was widespread around the area known today as northern and central New York State. Seneca County derived its name from that tribe when it was officially established in 1804. It is relatively small in both size and population, having the 6th smallest population in the state with about 35,000 residents. 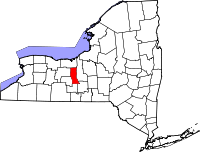 The town of Waterloo, NY, is the county seat and is the location of all county government agencies. The Office of the County Clerk is located in the Seneca County Office Building at 1 DiPronio Drive. That office maintains numerous types of records for the county, including property and deeds records, naturalization records, military discharges, and others. The County Historian is located at the same address and works closely with the County Clerk in maintaining historical records. The Historian's office provides a number of resources online as well as at its physical location.